Popko, my dad, has founded the Omega Research Foundation in 1984 (when I was two years old). The Foundation was to serve as a a vehicle for his research into cyclical changes within ecological and social systems. Last week, after 23 years of hibernation, the foundation has been geared up again to publish what Popko had already been wanting to publish these twenty plus years ago. So, what happened in between? For the last 15 years, Sicirec happened. Actually, Sicirec is still happening, but, starting last month, I don’t need to spend the majority of my waking hours on it anymore. 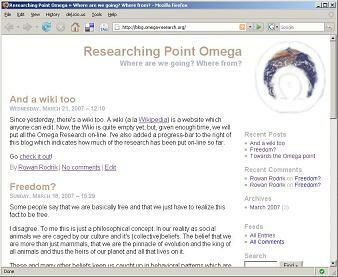 That’s why I registered the domain omega-research.org and installed a wiki and a weblog under it. Jorrit is also in on this project. We’re doing this together, the three of us, hoping to involve others from within and around our circle. 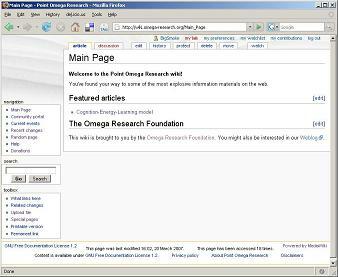 I’m still keeping the sites running for Popko, but, beyond that, I’m no longer involved with the Omega project. The cultivation of my cynicism and scepticism have made it so that I can no longer share my father’s faith in his (in my view, not entirely scientific) predictions.